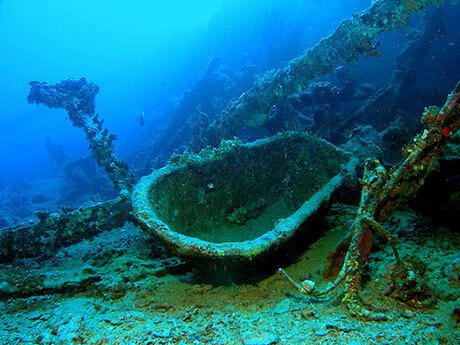 The Red Sea has some fantastic wreck diving, including the Thistlegorm which is currently number two in the list of the world's best wreck dives. Storms, strong winds, dangerous currents and countless reefs have made the Red Sea difficult to navigate for thousands of years. The ancient Egyptians were renowned shipbuilders and the Romans travelled along Red Sea shores. The advent of steam didn't diminish the number of wrecks. 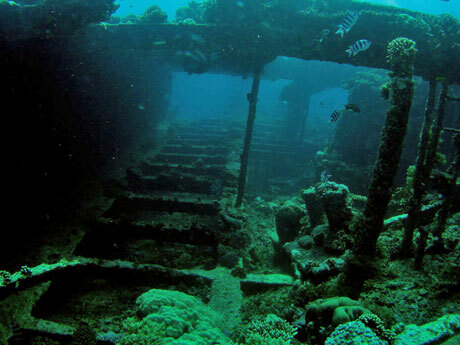 Even today it's not uncommon for ships to run aground on coral reefs. And of course there are those sunk in a war. Ghiannis D, photo: Tim Nicholson. You can do many of these dives as day dives from Sharm El-Sheikh, or, for the wrecks on the Abu Nuhas reef, Hurghada. However, the best way is by liveaboard - either from Hurghada or Sharm. Thistlegorm is Gaelic for Blue Thistle. A British vessel, it was attacked from the air and sunk in 1941 whilst carrying a cargo of war supplies: rifles, motor bikes, train carriages, trucks. A big wreck - 131 metres long. Currents can be strong, and in different directions at the surface and at the wreck. 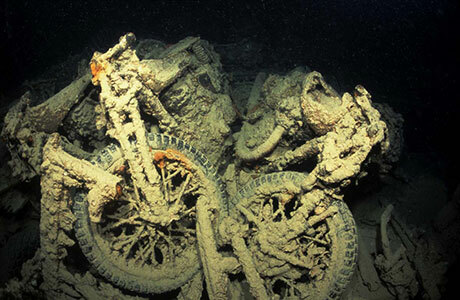 Motorbikes in the Thistlegorm, photo: Tim Nicholson. This large wreck is in very good condition. The Thistlegorm is in the Strait of Gobal, north of Ras Mohammed. 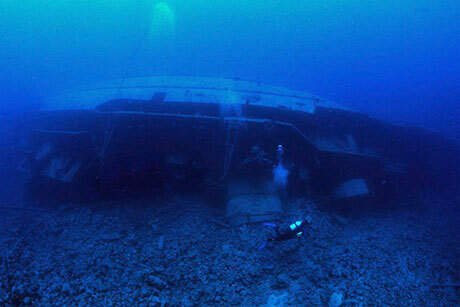 For photos see our Thistlegorm Gallery.
" History, wildlife and wreck. Something for everyone." " Magic dive saw lots of good stuff. " " The Red Sea is very nice, but way too many divers. I hear that Thistlegorm will be closed down, due to corrosion.. "
" An aquatic museum, amazing. It left me wanting more, and with some of the best memories of my entire life. I have dived Thistlegorm 4 times, utterly amazing, lived up to expectations. But once dived our second visit didn't deliver anything new, unlike my favourite Shark and Yolanda. " "Great wreck inside and out side. Lots to see and lots of life on it. " "I thought I'd dived the best wreck sites on this planet when I visted Truck Lagoom in Micronesia. 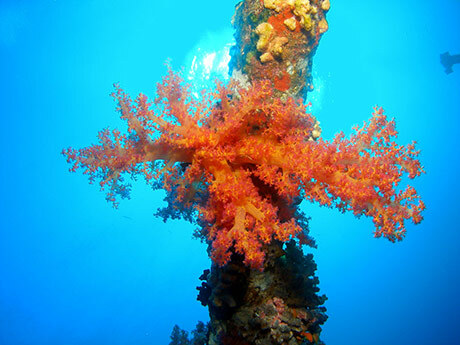 However not one of their wrecks compares to the absolute majesty of the Thistlegorm. It had a strong eery presence, it fully penetrable and host alls it original cargo (Trucks, ammunition, Rifles, motobikes etc). Excellent dive. " "Simply breathtaking! The ship is intact, amazing stuff to see, great visibility and just WOW! " "Nice dive. Penetration of the wreck provides a great experience. The 80F visibility makes this dive great. Though, dont expect to see many exotic fishes though. And most of the boat is covered in silt, so dont expect an amazing experience. " "The eeriness of diving there in a rough sea with the clanking sound of the anchor chains on which she sank beating against the fairleads, & looking through the ship's rails, bent & broken by the explosion, make you respect those who lost their life when she sank all those years ago." 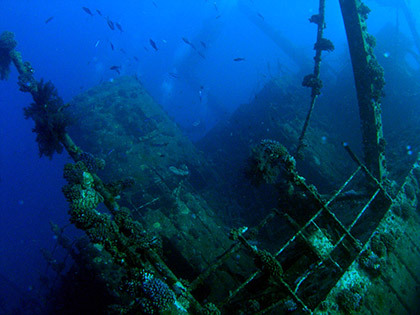 "The shipwreck is one of the most marvellous dives I have done to date. The holds cargo is extremely historic, whether is be the BSA motorcycles, or the various Morris trucks in hold 2. An absolutely cracking dive, which should be done sooner rather than later, as it is quickly deteriorating due to the swarms of divers visiting each week! " "If you are ever diving in the Red Sea area you must take a trip to the Thistlegorm no matter how early you have to get up to do it. I got up at 4 in the morning to do some early dives there. A fully preseved wreck where it's not only the superstructure but also the entire cargo including boots, rifles and trucks. " "Most fantastic recreationally accessible wreck I have ever been on. 126 m of beautifully coral encrusted hull with an astonishing load of trains, motorbikes, jeeps, tanks and artillery...to name just a few wonderful highlights, that never look the same twice. Maybe it's becuase you never have to dive it the same way twice - always a new route, up in one way, out another...oh and don't forget the sight of the propeller as you come around the stern. Ahhh! fantastic. " "Huge wreck with so much to explore, and very good penatration options. Full of equiptment, motorbikes cars and a couple of tanks to top it off, lots of marine life and several very large schools. " "A real priviledge to step back in time and see such a well preserved and interesting wreck "
"Just returned from Sharm where I dove on the SS Thistlegorm. The site had been closed down by Egyptian authorities for a month to install buoys on the side of wrecks so diving boats would not use anymore the wreck as a point of anchorage. Most dive operators could not find the new buoys and ending up tying up the rope to the wreck...Otherwise, by far the best wreck I ever dove, excellent visibility and truly an experience worth getting at 4 am for. " A lovely wreck with marvellous silhouettes against the surface. This Greek ship sunk in 1983 en route from Croatia to Saudi Arabia, after colliding with a wreck. 100 m long, the stern rests at 23 m. It is lying at a 45o and can be slightly disorientating. You can go in the engine room, which is big. Other rooms lead off this. Look out for an enormous grey mottled moray eel, of sea serpent proportions, as well as coral, prawns, mullet, butterfly fish and pretty pipefish (Corythoichthys schultzi). The Ghiannis D, Photo credit: Tim Nicholson. The Ghiannis D is north of Sha'ab Abu Nuhas reef, in the Strait of Gobal. 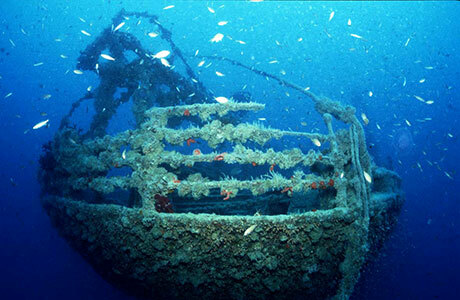 See underwater photos of the Ghiannis D.
"An absolutely beautiful wreck, teeming with life. If you have the nerve, penetrating the wreck provides an excellent view of this huge ship. One of my favourite dives in the Red Sea, and one which has to be done if you are near it. Shoals of Batfish, Giant Moray Eels, and the wreck itself are all amazing! " The Carnatic is on the North side of Sha'ab Abu Nuhas Reef in the Straits of Gobal. She was a sail and steam ship launched in 1862. In 1869 she struck and remained fixed on the reef. For two days she remained there with all passengers and crew staying on board. Just as they were abandoning ship she broke in half. Thirty-one people died but the rest reached the lifeboats and Shadwan Island. 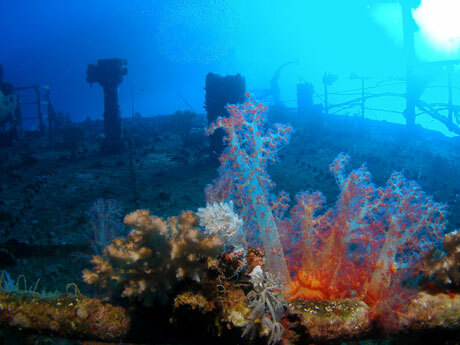 One of the older wrecks in the area, it is covered in beautiful soft corals. Soft coral, Dendronephtya hemprichi, on the Carnatic. Photo credit: Tim Nicholson. "Did the R.M.S Rhone many years ago in the British Virgin Islands, and loved it. A diver on the same boat told me about a virtually identical wreck off Hurghada, with similar tragic history/intrigue. The dive centre did it as a 'special trip' when the sea was flat and needed 7 minimum to go. An extra 20 Euros for this day - did another brilliant wreck as well - Giannis D, 100 metres away. Best diving 'day' I've had to date. " The Chrisoula K is on the eastern side of Sha'ab Abu Nuhas reef, in the busy Strait of Gobal shipping lane. You reach it by liveaboard or a day boat from Hurghada. 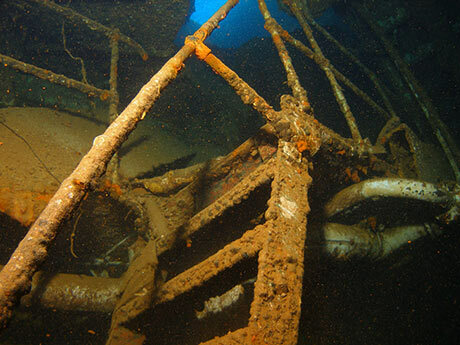 The bottom of this wreck slopes down from 7 to 26 m at the stern with the propellor and wheelhouse. At the shallow end of the wreck is a slightly broken up reef. The stern points north-east and currents are generally mild and south-flowing. A Greek boat with a cargo of tiles and stone, it was sunk in 1981. Look out for spanish dancers, schools of striated fusiliers (Caesio striata), box fish (Ostracion trachys) and masked butterfly fish (Chaetodon semilarvatus). The Chrisoula K, Photo credit: Tim Nicholson. "Chrisoula K (Greek). Suez, Aug 31 - Mv Chrisoula K, ran aground yesterday in the Red Sea, sustaining serious damage but no casualties...The vessel, carrying a consignment of tiles from Italy, was on her way to Jeddah." "The wreck is large and complete enough to explore thoroughly and dive several times and still find new things. It's home to a lot of the more unusual critters and reef species, like big tube sponges, boxfish and flatworms. Look out for the sohal surgeonfish at the shallow bow section! Lots of good coral here too. At the ed of our dive we spotted a pod of Bottlenose Dolphins cruising over the middle of the wreck, so overall brilliant dive and superb site. " "Great memories of that wreck "
Like other shipwrecks in the area she has many beautiful soft corals. The dive is good both for all levels of divers. More experienced can penetrate the wreck but there is plenty to see if you would rather remain outside. The top of the wreck is at just 6 m and the lowest part at 32 m.
The Kimon M, Abu Nuhas Photo credit: Tim Nicholson. This makes a good night dive. The barge is literally crammed full of fish, along with several lion fish (Pterois miles and P. Radiata). Take your camera. An enormous, toothless, moray also patrols here. Look in the coral for tiny crabs (Trapezia rufopuctata). The boat is upright, but only the hull remains. The barge is opposite Bluff Point Lighthouse, in the Strait of Gobal. For more photos see our Ulysses Gallery. During the war the Rosalie Moeller was transporting coal from Britain to Alexandria. She anchored in the Straits of Gobal in the Eyptian Red Sea. It was here that she was attacked by the German Luftwaffe, 2 days after they sank the Thistlegorm. She lies in 45 m, is almost totally intact and very scenic. Both masts are upright, there are many fish and you can swim from room to room. For more pictures see Room 9 of our Photo Gallery. For more photos see our Rosalie Moeller Gallery.
" Another very good dive site will plenty to see. " The wreck lies upside-down. Enter the wreck at the stern. You can then swim the entire length inside to the bow, which is on the reef (18 m). Be careful not to stir up the sand and mud on the bottom. End the dive by swimming along the reef. Lots of sea life. An enormous napoleon or maori wrasse (Cheilinus undulatus) may greet you on the way down. The wreck is broken half way along, and an amazing shoal of glass fish school here. Look also for nudibranchs and regal angelfish (Pygoplites diacanthus), plus large groupers. The Dunraven was a British ship, returning from Bombay to Newcastle carrying a cargo of wool and cotton. It sank in the 1870s. It was powered by both sail and steam. Like many wrecks, the Dunravn is in the Strait of Gobal, north of Beacon Rock and 12 km West of Ras Mohammed. "Wonderful upturned wreck with lots of marine life, spotted some banded shrimps and glassfish. Stern drips classic red sea soft corals. The Dunraven lies at the base of a very pretty reef wall to explore afterwards too; saw two huge purple Stonefish hanging around the top, plus porcupinefish, red anemones, courting giant morays and a Napoleon wrasse. " The Kingston ran into the reef at Shag Rock in 1881, with no loss of life. She lies on a sloping reef wall in 4-19 m of water. Large shoals of goatfish stay close to the wreck, giant morays live within and turtles are often seen there. The wreck lies perpendicular to the current so can provide shelter. The reef it lies on is very pretty, featuring a mass of hard table corals. The Kingston, photo Tim Nicholson. The Kingston was built in 1871 and was one of a new type of ship which had a funnel as well as two masts. When she was first discovered, she was referred to as the Sarah H until her real identity was discovered. (According to Ned Middleton - author of Shipwrecks from the Egyptian Red Sea - Shlomo Cohen discovered the wreck and, as he had to refer to it as something, called it after Sarah Hillel - dive guide and wife of the dive boat's captain). Her location is marked on the map above - the second tag down. The wreck has no entirely enclosed areas. The beauty of the corals, the large shoals of fish and the structure still remaining make it a very enjoyable dive. Although most commonly referred to as El Mina, the ship was actually called the Miniya. 58 m long, El Mina is almost completely intact and is permanently buoyed. Follow the buoy line down and dive along the outside of the wreck. You will see a machine guns, still loaded. The interior is cramped and crumbling so it's not recommended to go inside. El Mina, photo Tim Nicholson. "Egyptian miliatry ship it sank during cold war in 1972 no life losses"
The wreck of a roll-on roll-off ferry which sunk in 1991. 470 Lives were lost. It as on route to Safaga from Jeddah and overloaded with pilgrims returning from Mecca. I dived it shortly after it sank, without realising what I was diving. I've never dived it since. The sight of the luggage and people's belongings lying new on the seafloor and the growing realisation that this was a recent tragedy made for one of my worst ever dives. Ever found yourself re-writing the dive guide into your logbook or copying the maps and text of the dive centre�s books? If you have then you might consider buying the Travelling Diver�s Guide and Logbook. Includes Dunraven, Thistlegorm, Carina Brick Wreck, Kingston, Ulysses, Gubal Barge, Rosalie Moeller, Ghiannis D, Carnatic, Crisoula K, Kimon M, El Mina and Excalibur. Read our review. 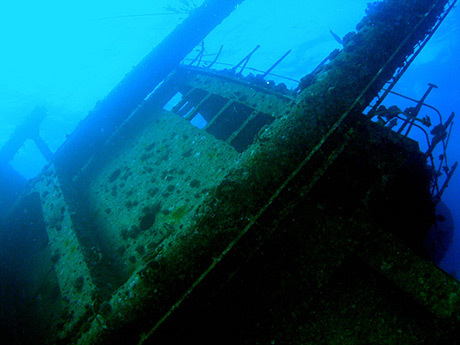 Please add your comments on wreck diving in the Red Sea, or anything else on this site.